Helping adults meet their career and personal goals is a key component of working in adult education. Adult educators work with people learning English, looking to retool their skills or trying to pursue their passion later in life. With today’s technology, it’s possible to earn a degree in adult education online, so students can attend classes when and where it’s most convenient. Continue reading to see where an online adult education degree can take you. Earning an online degree in adult education can allow for personal and professional advancement in a competitive job market. Online learning is beneficial for its flexibility, helping students to maintain their current daily schedules while still advancing their education. To save students the hassle of combing through the numerous schools offering adult education programs, we’ve looked at what each school offers in terms of cost, success rate, and student services, and we’ve picked the top programs offered around the country. Check below to find the best online adult education programs for 2017. The adult and lifelong learning program at the University of Arkansas qualifies scholar/practitioners to deliver and enhance education for adults in variety of capacities and formats. Upon graduation, participants will be prepared to work with adults engaged in educational pursuits offered by nonprofits and community-based groups, as well as learners pursuing secondary and postsecondary education. They may also work with adults involved in executive and professional education endeavors. The graduate program follows standards that were developed by the Commission of Professors of Adult Education, and students will be instructed by faculty who have hands-on experience in the field. Graduate students interested in careers in adult learning can complete a master's program at Morehead State University in as little as one year. The program results in an MS in adult and higher education. The program is offered to distance learners, who can also finish the online option in as little as 12 months. The program, like all those offered by Morehead, is accredited by the Southern Association of Colleges and Schools. The flexible program is taught by seasoned instructors with field experience, and students will be guided through their academic journeys by Graduate School personal advisors who help with academic forms, course selection and university resources. Troy University, which began as a normal school for aspiring teachers, offers a variety of adult education programs at the graduate level, including thesis and non-thesis options. There is also a graduate certificate program, and students can choose tracks in instructional design, instructional technology, leadership studies and workforce development. Graduates will be qualified to move onto careers in universities, four year colleges, two-year colleges and technical colleges. They may hold office management positions, work in student affairs or follow careers in program development. Other career options include the military, the private sector, and state and local agencies. The adult education program at Indiana University-Bloomington, which can be completed online, results in a master of science in education degree. Students will learn the fundamentals of program planning, as well as the historical and theoretical context of adult education in America. The program, which is among the oldest of its kind in the nation, was established in 1946. It has been offered to distance learners in the online format since 1998. Graduates can pursue careers in both the private and public sectors as teachers, administrators, technical instructors, academic advisors, instructional designers, corporate trainers and human resource professionals. Graduate students will leave the adult education program at SUNY Buffalo State with a master of science degree and the skills needed to enter careers in the fields of human resources and adult education. Other graduates may choose to move on to further education at the doctoral level. The 30-credit program includes nine credits applied to a field specialization, which will be chosen with the help of an advisor. Options include linguistics, literacy, administration, creativity, multiculturalism, education computing, health and wellness, and vocational education. Those who enter the program with limited adult education experience may also participate in an internship. The Kansas State University Global Campus offers a master's degree in adult and continuing education online to distance learners. Participants have the option of combining the degree with one of the school's online certificate programs. Students can also choose to incorporate traditional, face-to-face courses as well. As students advance through the program, they will develop a portfolio, which is due during the student's last semester of coursework. Degree candidates cannot fulfill the required final examination without their portfolio. Prospective students are encouraged to check out a program-specific blog maintained on the university's website. Billing the program as "the region's only adult educator graduate degree," the University of Southern Maine offers a master of science degree to graduate students. The program, which requires a minimum of 36 credit hours to complete, is delivered 100 percent online. Students can start at any time, and will have assistance from an admissions counselor before they register. Students will leave the program prepared to work in environments as varied as K-12 schools, the nonprofit sector and corporations in the private sector. The self-paced program allows working adults maintain their current schedules. The School of Education, Health Professions and Human Development, which is part of the University of Houston-Victoria, offers a master of education degree in adult and higher education. The program, which students can complete 100 percent online, comes with two options. The adult education track is designed mostly for working educators in fields like health education, community agencies, religious institutions, and corporate training and development. There is also a higher education track, which was developed for professionals working in settings such as community colleges in roles like staff member, advisor, administrator and student affairs advisor. Distance learners can pursue a master of arts degree with a concentration in adult learning completely online at Northwestern State University of Louisiana. There are three tracks: homeland security, adult and workforce development and e-learning. The program focuses heavily on technology and was developed according to the guidelines of the Commission of Professors of Adult Education. The school offers a self-assessment quiz for prospective students who are unsure if distance learning is right for them. Online learners will watch lectures, submit assignments and complete projects, and the degree is identical to those earned on campus through face-to-face instruction. The Graduate School at East Carolina University offers a master of arts in education degree for students pursuing careers in adult education. The program is only offered online, and it begins in the fall, spring, and during three summer sessions. The multidisciplinary program provides students with philosophical, historical and theoretical instruction while teaching instructional strategies and processes, as well as program development. The majority of students pursue the program on a part-time basis. Distance learners will have the same access to school and student resources, advisory staff, and research and library materials as their on-campus peers. There are a number of paths professional adult educators can take, but many begin by teaching courses in the evenings since that’s when most adult learners are available. The graphic below highlights one possible career path to becoming a full-time adult educator. The dawn of online learning brought about new opportunities for anyone looking for further education. Program flexibility allows students from all over the world to access quality programs, as a degree earned online is virtually the same as one earned on campus. Most online programs are designed with traditional programs in mind. However, learning activities are modified to work in an online environment. Conversations typically take place in a discussion thread in the online learning system, and group work is completed through email, chat programs and conferencing tools such as Zoom or Skype. Many online programs offer asynchronous learning, allowing students to access course materials at any time. However, some have synchronous components that require students to be present at specific times. Online adult education degrees have an added component that many other online programs do not: student teaching. Many colleges and universities require aspiring adult educators to demonstrate mastery of the program’s concepts through student teaching at a school near them. This could include shadowing an experienced and practicing teacher through several weeks of instruction. People searching for an online degree in adult education have several options to choose from, depending on their current education level and their career aspirations. Furthermore, most programs are designed to both accommodate students’ interests and work around their schedules. Some of the most common program options are outlined below. Some undergraduates just know they are destined to teach others, and they have a calling to help educate adults. While not offered in many universities, an online bachelor’s in adult education can prepare students for a career in education. These programs are often geared toward nontraditional students, and some require incoming students to have some work experience under their belt. As a result, programs are generally flexible while maintaining a cohort model in which students learn and grow together. In an undergraduate adult education program, students become familiar with learning styles and adult learning theory as well as instructional design and foundations of continuing education and training. Some programs require students to spend time in a real work environment assisting another teacher or trainer. Graduates of this typically 120-hour degree are equipped to take on entry-level positions working in a corporate training environment. Aspiring college professors should first earn a Master of Education in adult education (also called a master’s in adult education) before pursuing a doctorate in the field. A master’s degree will allow the graduate to teach a specific content area as an instructor in a community college setting. This degree is usually about 33 to 36 credits long and focuses on practical ways to teach adults, delving into approaches to facilitate student learning and create positive classroom dynamics. Students also study research and theory and how it impacts the implementation of a specific curriculum. Most MEd programs require a student-teaching component, especially if the enrollee’s bachelor’s degree is in an area other than education. A Master of Arts in adult education fulfills the requirements for teaching in a community college setting. It also allows those who wish to train employees in a corporate environment the ability to move their careers forward. This degree is for students who wish to learn more about the pedagogy and theory of teaching, rather than focus on one particular area of concentration. Most programs are 36 credit hours and include courses in curriculum theory, organizational communication and multicultural strategies. Students learn how to communicate with diverse groups of learners in a variety of settings — including via social media and with trainees on-site. They study techniques to design curriculum and learning activities that speak to different learning styles and ability levels. Most programs utilize a wide range of technology to prepare graduates for the workforce. An online education specialist degree (EdS) allows the graduate to work with adults in basic education programs, vocational education and technical programs at a higher level. Students pursue this degree because they hold a master’s degree and want to further their careers but aren’t ready to seek a doctorate degree. They want to move to a leadership role and gain the skills and knowledge to help both students and fellow teachers. The degree is around 30 to 33 credits and includes courses in communication strategies, leadership and educational ethics. A person with a Doctor of Education degree assesses, designs and implements educational programs for a variety of adult learners, either in a college setting or in another educational model. As a cumulative project, students in an EdD program often develop and implement an adult learning project in a real-world setting. Those who want to earn an EdD should hold a master’s in the field and be prepared to complete about 60 to 70 credit hours in adult learning theory, program planning, and adult learner management. A PhD is a pathway to a career in scholarly research in adult education. In addition to researchers, graduates may also go on to become faculty members, university deans or community college presidents. Programs are usually about 90 credit hours and focus on adult learning theories in distance learning as well as research skills and critical analysis. Applicants should already hold a master’s degree or its equivalent in post-baccalaureate graduate work. Adult educators who hold a bachelor’s degree but aren’t ready to move forward with a master’s degree or doctorate can earn a 12- to 15-credit online graduate certificate in the field. Students learn the history of adult education and how it’s delivered while also studying how courses are designed and delivered either online or face to face. Graduate certificates present a good stepping stone for graduates to get their feet wet in the industry. People who struggle through secondary education often go back to school as adults to acquire basic skills so they can be successful in the workforce. This course assists aspiring adult educators to assess these students and help them work within their abilities. Curriculum courses teach students how to measure learning through assessment and to develop meaningful classes and learning activities. Students learn what strategies and competencies they need to master in order to facilitate adult learning. Becoming proficient in research methods allows graduates to turn into lifelong learners as they grow their careers. Research courses help students select quality sources and evaluate trends in education. Technology — online or other — is used in many adult learning programs, so students must learn how to use tech to design, implement and assess learning. Decide which degree type fits their career goals, time frame and budget before getting too far in the research process. Identify the prerequisites for the degree they would like to pursue. Check the accreditation status of the college. Determine if the college meets their state’s certification requirements. Find out if the school has on-site or student-teaching requirements. Call shortlisted schools and talk to adult educators about the reputation of the schools. Find out what support services are available for online students, including tutoring, career advising and counseling. See what financial aid options the program and/or school has. 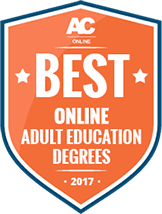 When researching the best institution for a degree in adult education, it is important to look for one that is accredited. While accreditation is optional, it’s a good indicator of a quality program that is in tune with today’s workforce needs. Accreditation illustrates that the college and/or specific program took measures to ensure it offers quality programming for students. Students should look for two things. First, the school as a whole should be accredited by a regional accrediting body. Second, the online adult education degree program should be accredited by the Council for the Accreditation of Educator Preparation. For more information about accreditation, visit our page on the process. Wanting to earn a doctorate in adult education is one thing, but figuring out how to make that happen is quite another. Keeping a timeline of the steps to take is key. The timeline below is just one example, though deadlines will vary by school. A degree in adult education can be the start of a rewarding career. There are a number of different career paths one can take, all of which are expected to grow in the coming years. Earning a master’s degree in adult education allows the graduate to pursue a job as an administrator in a postsecondary institution or design curricula for a corporate training organization. A master’s degree also provides a stepping stone to supervisory roles. Some adult education jobs require specific credentials in order to teach in certain states. While others don’t require credentials, additional certifications nonetheless boost job candidate’s value. Every state has different requirements for educators of adults. Below is a typical path to earning an adult education teaching credential. However, it’s best for educators to contact their state’s department of education for specific requirements. Students who enroll in an online program in another state should be certain that the program fulfills the requirements of the state they plan to teach in. Some aspiring adult educators may find that, after doing their research, the career simply isn’t for them. For people interested in teaching younger students instead, some similar online degrees to look into are below. Early childhood teachers work with children from birth to age five. Programs in this area focus on brain and motor skill development for young children as well as strategies to meet the educational needs of a very dependent population. In an elementary education program, students learn to work with K-8 students to prepare them for high school and beyond. Special education teachers are trained to teach students with physical or intellectual challenges that prevent them from learning in a traditional classroom. In a special education teaching program, students learn to work with students in and out of the classroom.